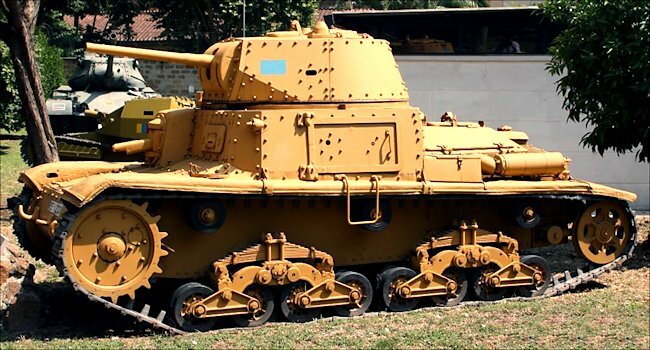 he Medium Tank M14/41 is essentially an improved version of the M13/40 which was one of the Italian's most promising designs from the early period of the North African war. Although there are visual differences between the two it would appear that these were introduced in stages so you can find examples of M13/40 tanks with features commonly associated with the M 14/41 and vice versa. . When it first appeared in 1941 the M13/40 was probably the equal of its British counterparts in terms of firepower, but that was about all. The armour plate had a tendency to crack under fire and the method of construction. using rivets and bolts. was lethal. Considering that the Italians probably had more experience of using tanks in desert conditions than anyone it is odd that the tank proved underpowered and unreliable. This at least was cured by the more powerful M14/41. The engine is located at the back. driving a gearbox and sprockets at the front. The suspension. which included bell cranks and leaf springs. was also somewhat archaic while the large door in the side of the hull was a serious weak spot. . The Italians failed to produce any better designs. suitable for combat. before 1944 so the M13/40s and M14/4 tank found themselves matched against much more powerful tanks such as the Grant and Sherman. 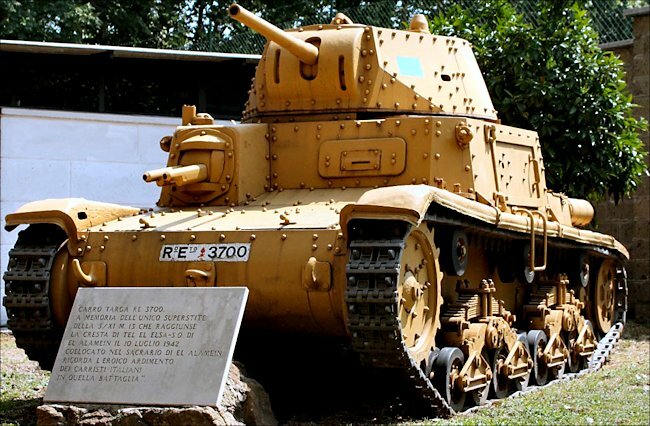 In spite of their faults the Italian tanks were used with a great deal of determination on occasions while captured M13/40 tanks were used briefly by British and Australian troops in the desert . It had a crew of 4: Commander, Driver, Gunner and loader. Its armour ranged from 15mm to 42mm. It was powered by a Fiat SPA 15T M41 V8 diesel 145hp engine that enabled the M14/41 tank to have a top road speed of 32 kp/h (22 mph). It had an operational range of 200 km (124 miles). It weighed 14 tons and was armed with a 47mm cannone da 47/32 M35 gun and could carry 104 rounds. It was also armed with 3 Breda-38 8mm machine guns. It was manufactured by Fiat Ansaldo and they produced 752 tanks.